Exploring the roots of resurgent evangelicalism in the United States, Stephen Warner tells the story of one small-town church from 1959 to 1982, the Presbyterian Church of Mendocino, California. 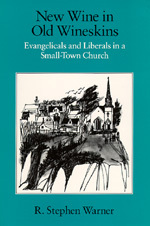 This book chronicles the actions of the men and women who struggled with and against one another to shape their church. R. Stephen Warner is Professor of Sociology at the University of Illinois at Chicago.